The prospect of the club’s first over 35s game in ages attracted stars from far and wide. Mr. N. Williams (Tsar of Moscow) flew in from Azkaban, and yours truly from the cultural deserts of Kuwait. Unfortunately, only one of us survived the rigours of a pre-match session in Bidi’s the day before as the Tsar of Moscow pulled a fetlock rushing to the bar and joined the growing list of late withdrawals. Against doctor’s orders, Mr. R. Khanna (Patron of Putney) bravely decided to risk his dodgy hammie, and completed a less than spry looking XI just before kick off. In true social cricket fashion we met up for a pre-match beverage in Kickers to keep Blikkies company, and then repaired to the pitch where Captain Banerjee (Advisor to Businesses) duly won the toss and elected to bat. Greg and Pottie opened up on a slow, low pitch against some elderly dross, and cruised to 17 in the third over. Greg then got bored and chopped onto his own stumps to his absolute disgust and departed for a swashbuckling 2. Jonesy and Pottie moved the score along nicely to 39 before both departed to innocuous deliveries for 22 and 12 respectively, and after a fluent 8 I joined them, spanking a full toss back to the bowler. At 58-4 Cookie was joined by the non-injured Nathan (Cartwright) and set about repairing the damage. Dealing mainly in ones and twos (much to Nathan’s delight) they moved the score on to a more respectable 121 before Nathan decided he was done for and capitulated, stumped for 31. The arrival of Mr. Harvey at the wicket prompted an acceleration in the run rate, and after a cautious start even Cookie cut loose. The score raced to 191 with a couple of balls left, at which point Nick was bowled for 31, leaving Etienne to face one ball after warming up with his son for the previous 15 overs. Cookie was undefeated on an excellent 53, with 36 extras contributing to a par score of 193 for 6. Following current IPL fashion we opened up our bowling with a combination of searing pace (Greg), and mystery spin (Badger). Greg bowled well (4 overs 0-23) but struggled to get the ball above shin height on a dead pitch. In an eventful second over which went for 17, Badger tricked one of their openers into trying to knock the pastry off a tempting steak and kidney, and hit him plum in front. 1-25 off 2 overs for Badger, so he was hauled off and replaced by the far more parsimonious Etienne who bowled well for 0-19 off his 4 overs. MoM Cookie replaced Greg at the ICC end, and bowled tightly, taking 1-20 from his first 4 overs, aided by a great tumbling catch by Greg in the deep. At the drinks break the Mammoths were 82-2, and needing more than 9 an over, with Nick Harvey replacing Etienne at the Bradenton end. His first over was eventful to say the least, with two sitters dropped by Greg and Badger, a farcical missed run out chance, a run out by Nathan thanks to the mis-named Lucky, and finally a wicket for Nick, bowled all ends up. First ball of his second over was a real jaffa, clipping the top of off stump to leave the Mammoths close to extinction. However, at the other end, Jonesy decided to make a game of it, getting smacked for 40 from his 3 overs as Ranjit and Sadiq kept the Mammoths in touch with the asking rate. Ash replaced Nick (2-18 from 3) and restored the balance in favour of Darjeeling, having Ranjit caught behind for 40, and bowling the new guy first ball. He finished with an excellent 2-17 off 3 overs, and with about 30 needed from the last 3 in a moment of madness/genius he tossed the ball to Badger. A good catch by Nick and 5 runs later, Mammoths needed 25 from 2, and tight overs from Ash and Cookie left them 17 short with 9 wickets down. A good win, celebrated in customary style in Kickers afterwards, with the players joined by a number of the younger club members who had been staying hydrated while we sweated our proverbial’s off. I bade a tearful farewell as I headed back to the airport, but a great weekend catching up with some top chaps. 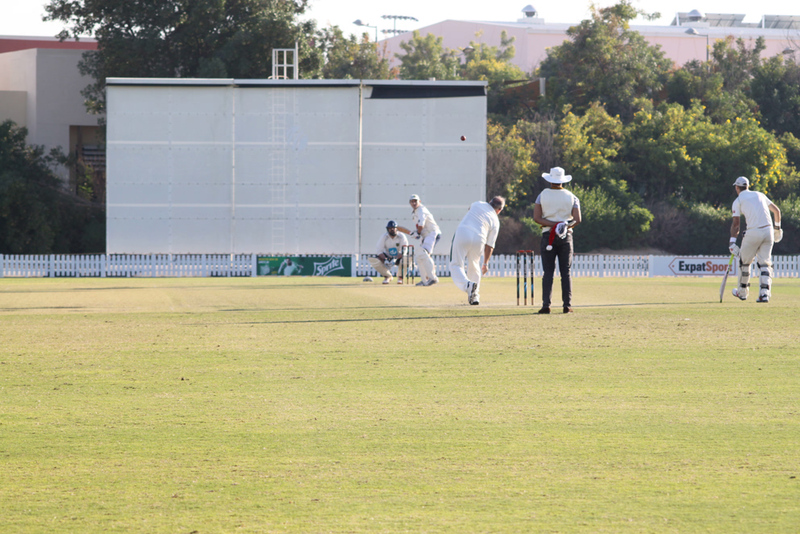 This entry was posted in Cricket and tagged 2017, April, Cricket in Dubai, Cricket in the Middle East, Cricket in the United Arab Emirates, Cricket Match, Dubai Mammoths, Friendly, ICC Academy, Match Report, Saturday. Bookmark the permalink.